Many of the worst symptoms of American poverty are rooted in the instability brought on by eviction, according to a new book by sociologist Matthew Desmond. A 13-year-old boy in north Milwaukee throws a snowball at a passing car, and his family lands in a homeless shelter. So begins Evicted, sociologist Matthew Desmond’s wrenching and revelatory investigation of urban poverty in the United States. At first, the incident appears to be some cruel and random injustice: The infuriated driver storms from his car and kicks in the front door of the boy’s house. As a result, the kid’s mom receives an eviction notice from the landlord, giving the woman and her two sons (the boy has a 5-year-old brother) just days to leave the apartment where they’d lived for eight months. This careening course of events turns out to be anything but anomalous. In Desmond’s meticulous, compassionate rendering of the 15 months he spent living among Milwaukee’s poor and transient as a graduate student, such appalling circumstances are the norm rather than the exception. The boy’s mother (whom Desmond calls Arleen) finds a new place to rent three months later, only to lose that home within weeks when city inspectors deem the dwelling “unfit for human habitation.” Among other breaches, the $525-a-month house often had no running water. But where else were Arleen and her two sons to live? Soon enough, the reader loses count of the number of Arleen’s forced displacements. Throughout her odyssey—one of eight chronicled in Evicted—home is always just out of reach, even when Arleen temporarily secures housing; the upheaval of displacement is more consistent than any one dwelling. Housing inspectors, child-protection investigators, police, welfare-case managers, bosses, judges—they all wield the power to sabotage a poor family’s tenuous stability. Keep in mind that in the depths of poverty, “family” itself is a fluid form: Whether in Milwaukee’s poor black neighborhoods or in a white trailer park on the city’s southern fringe (each the subject of Desmond’s keen focus), households cohere and divide as readily as puddles of mercury. Members are added or subtracted as circumstances demand—sometimes relatives, sometimes people in cohabitations of convenience. In one startling instance, Desmond describes two total strangers pairing up on the spot (the clincher: a microwave oven). The force behind the authorities’ power is inexorable: Landlords want their rent money and have an incentive to push out anyone who jeopardizes it. If the police show up in response to a 911 domestic-violence call, or a kid stops up the toilet with toys—well, such unwelcome incidents carry the risk of fines to the landlord for nuisance citations or housing-code violations. Tenants who fall short in terms of conduct or funds must go, and so they do, as easily as calling the exterminator (assuming the landlord ever calls an exterminator). Landlords must profit, and they profit most readily from those with no bargaining power and no other options: This is the hard economic reality on which Evicted turns. Both a rigorous scholar and a gifted narrator, Desmond frames his study from the start as an examination of fraught economic relationships: between landlord and tenant, between small entrepreneurs (often on a precarious footing themselves) and the poor renters who are their captive market. The deal is sweetened by government subsidies to the poor, from Supplemental Security Income to Section 8. Probing these strangely intimate relationships in dazzling detail, Desmond unearths resounding revelations about how the US housing economy so profoundly fails the poor—devouring the great majority of their wages while supplying only fleeting stability, and subjecting tenants of limited means to a swarm of avoidable hazards. There has to be a better way. The owner of the dead-end trailer park where Desmond lived for months took little interest in this strange graduate student, so long as he paid the rent. But the author finds a willing and (to a point) sympathetic landlord for his inquiry in Sherrena (not her real name), a professional property owner understanding enough of her tenants’ circumstances to bring one a bag of food-pantry groceries one day—and just as ready on another to haul that same tenant into court on an eviction notice when the rent payments fail to arrive in full. With moxie and an eye on cash flow, Sherrena has amassed a shabby real-estate empire by buying decrepit properties for between $5,000 and $17,000 at a time on the North Side, the neighborhood where poor black tenants with criminal records, eviction histories, or government checks find their only welcome. The sum of their rent would suffice as a down payment for those in less desperate circumstances to buy such a property outright with a federally insured mortgage; Sherrena chalks this up to just another cost of being poor. Helped by her handyman husband, Sherrena is far from alone in profiting from Milwaukee’s widespread poverty. 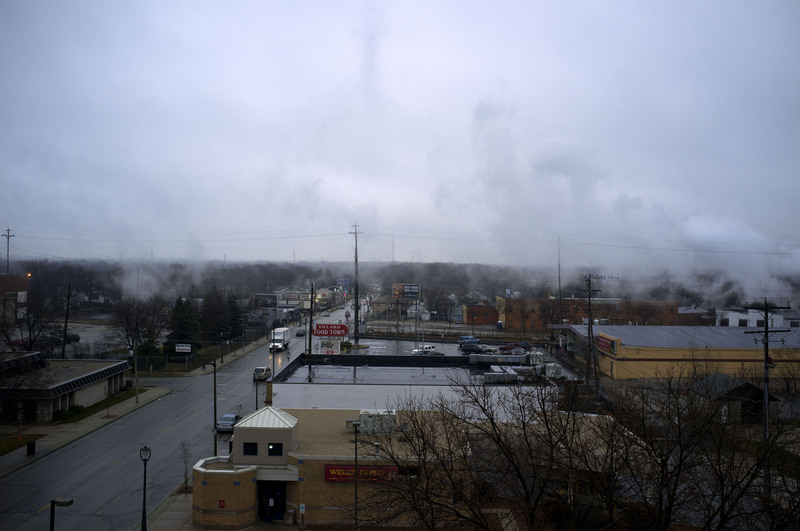 Trading in the shells of real estate built on the crumbling foundations of Midwestern industrial prosperity, slumlording and its many components are themselves a booming industry. Movers stand ready on speed dial to show up with their trucks at the sheriff’s side. Storage facilities teem with shrink-wrapped piles of possessions, destroyed if (more likely when) the ex-tenants’ payments fail to come through. Courts collect ample fees every time a landlord moves to evict, while landlords rack up late fees whether or not an eviction happens. Cash-poor tenants offer handyman services in the hopes of rent forgiveness that more often than not fails to materialize. Even more profitable, by Desmond’s math, is the shabby trailer park on the southern edge of town, treasured by its white residents for its location far from the black North Side. Long operating under a “don’t ask, don’t tell” arrangement that never would have lasted on the north side of the Menomonee River, the trailer park functions as a haven for people addicted to drugs, where a fix for a neighbor in early-stage withdrawal substitutes for the proverbial cup of sugar. Desmond estimates that the owner netted nearly a half-million dollars a year running the park, a place where his own trailer didn’t have even a reliably working water heater. Sherrena, for her part, nets $10,000 a month, which in Milwaukee makes her a burgher of no small means: She has a condo in Florida, an annual vacation in Jamaica, and takeout food in the fridge. Back across the river, a tenant of Sherrena’s finds herself in a trap when the toilet fails to flush. Although the tenant complained, the broken plumbing went ignored. Then her decision to withhold partial rent in an attempt to force repairs backfires when a cutback in her work hours leaves her unable to catch up in full. So the tenant and her family move in with her mother and sisters in the apartment downstairs, where their overcrowding quickly breaks the plumbing all over again. Landlords get away with these affronts to human health and dignity, Desmond contends, because they wield disproportionate power, enforced by the relentless machinery of the courts. Nor do housing codes provide any relief: No tenant in her right mind would call in city housing inspectors to report a leak or broken fixture, because those inspectors can be counted on not only to ticket the landlord for the grievance at hand but also to issue a heap of other costly code violations while they’re at it, in slums with no lack of them. That’s as good as requesting an eviction notice from an infuriated landlord the next time the rent payment falls short. Time and again, Desmond’s case studies show that an impoverished renter’s struggles with housing—from rents that consume as much as 70 percent of her meager income; to coping with the depressing and disabling squalor; to dragging her kids from school (and herself from work) to fight eviction or to move, rotating her children through school after school—will keep her poor, closing the door again and again on any possibility to advance. Those burdens are somewhat easier for the white trailer-park residents, who—while they enjoy no better economic circumstances—live inside a looser straitjacket on their future options. Family members may—just may—have the means to come to the rescue with cash to stave off the sheriff. If not, future landlords may overlook the tenant’s drug, crime, or eviction record—a mercy unavailable to black applicants. In the trailer park, the adversaries tend to be internal, above all the ravages of drug addiction; in Evicted, it costs a nurse his license. A neighbor living on disability checks and food stamps, meanwhile, memorably succumbs to the temptations of America’s consumer bounty. With rent the blazing sun around which existence revolves, ebbs and flows of cash mark the seasons. February brings the earned-income-tax-credit check that lets tenants catch up on winter’s arrears. A winter moratorium on heating-gas disconnections helps too, but in April those bills come due, leaving landlords in the lurch and prompting a summer spike in evictions. It’s far from incidental to these tenants’ troubles that Milwaukee ended welfare in the 1990s, substituting a jobs program called Wisconsin Works, or W-2. In Jason DeParle’s excellent book on that upheaval, American Dream (2004), women who participated in the early years of the work program suffered some of the same struggles as Desmond’s subjects, like getting the power cut off when their cash falls short due to the program’s punitive sanctions. Yet when DeParle was writing, evictions only befell those who went to war with their landlords’ tolerance, by smoking the rent money in a crack pipe or hosting wild parties. Housing, at least, anchored the women DeParle chronicled. Desmond shows that a crueler Milwaukee now sets women and children adrift from even security in a shelter. The difference may be explained by a shift in storytelling perspective—or a true deepening of misery since the early 2000s. Desmond did his fieldwork in 2008 and 2009, a time when the foreclosure crisis exacerbated housing woes, with many people forced to leave through no fault of their own, but rather that of their overleveraged landlords. Meanwhile, the relentless pressures of W-2 endure—especially for those in tenuous, low-wage jobs with unpredictable changes in hours and schedules that can wreak havoc on a no-room-for-error household budget. Once the cycle of eviction begins, frequent moves lead to missed mailings about mandatory case-management meetings, which lead to financial sanctions on government benefits checks—and an express track right back to an eviction in housing court. Desmond works hard to make the case that evictions are, in fact, more prevalent now than they were in the past. The evidence remains scant, however, because so many tenant displacements happen off the books (as do their tenancies). Finding a dearth of data from which to draw larger conclusions about the experiences of Milwaukee’s tenants, Desmond undertook his own survey of more than 1,000 people; he finds that forced moves are about three times as common as court records would ever reveal. Other sociologists have ventured before into the realm of popular literature—I bought Sudhir Venkatesh’s Gang Leader for a Day in an airport—but none in recent memory have so successfully bridged in a single work the demands of the academy (statistical studies and deep reviews of the existing literature) and the narrative necessity of showing what has brought these beautiful, flawed humans to their miseries. What Desmond’s intertwined threads of data, scholarship, and literary anecdote render indisputable is that the toll of forced displacement has rarely been greater. Using court records, tenant-screening companies compile the names of tenants who have been evicted or have simply filed complaints about blighted conditions; those names end up on electronic blacklists that make it difficult to find decent housing again. (The most ruthless slumlords stand ready to serve this most desperate market niche.) Meanwhile, an aging urban housing stock decays and dwindles with each passing year. Downsized legal services leave all but a few poor tenants unrepresented in court against landlords, with correspondingly lower chances of success in their defense. Desmond limits his study to a steadily shrinking city, leaving unaddressed, except by implication, the struggles of poor tenants in urban boomtowns like Oakland and Brooklyn, pushed out by wealthy newcomers embracing the until recently forgotten wonders of the urban lifestyle. On either end of these urban extremes, in prosperity or decline, the result is the same: The poor tenant has nowhere to go. Acknowledging that the comparison is a bit of a stretch, Desmond posits that for Milwaukee’s black women, eviction is as defining an experience as prison is for black men—a mark on their record that follows them for the rest of their lives. For women with kids, the failure to provide a secure environment for their children proves especially crushing, and so we witness women trapped in this agonizing cycle eking out their lives in a kind of depressive haze. “Poor black men were locked up. Poor black women were locked out”—and at higher rates than anyone else in Milwaukee, Desmond pithily concludes from on the findings of his survey. Here begins the refrain known to scholars and nonprofit real-estate developers as “housing first.” The idea is based on ample research showing that affordable housing in itself provides stability and security, allowing far better progress for poor tenants across the board—with mental-health treatment, addiction recovery, school success, employment, you name it. Home comes as the necessary condition from which any further human advancement can spring. After “housing first,” the theory, comes the hard test of politics and economics: how to bring the not-insignificant cost of real estate within reach of the poor. Only about one in four households currently eligible for government rent assistance currently receives it, in the form of public housing, rental vouchers, tax credits for developers, or other means. Nearly a century after housing reformer Edith Elmer Wood concluded through exhaustive research that no solution to America’s slum problem was possible without government intervention to help house unskilled laborers, this enduring economic fact goes shamefully ignored. So just expand existing federal aid, right? After all, Washington spends billions more on rewarding homeowners with a generous mortgage-interest deduction than on all housing aid for the poor. Also, Congress has preposterously frozen funds for such aid. A shift in resources—perhaps with debt and income limits on the mortgage-interest deduction generating revenue for more federal housing aid to the poor—is long overdue, and would surely be the most effective way to address the problem. Well, yes and no. Desmond is astute and honest enough to discern that subsidies such as Housing Choice Vouchers disproportionately line landlords’ pockets, often at rents higher than they could otherwise charge, perversely serving to increase the price of the scarce pickings available to the poor, even while serving only a small fraction of those in need. One of Evicted’s running concerns is with the question of who benefits more from antipoverty subsidies: the poor, or those who have built businesses out of profiting from their meager benefits. Too often, it’s the petty entrepreneurs—a low-burning scandal in the background of Evicted is the role of government in perpetuating tenants’ miseries. Nor does Desmond see public housing, which has destructively concentrated poverty in city after city, as much of a solution, dismissing it as a dismal failure even years before the current cycle of savage disinvestment from Washington. Rather, he envisions the ripest possibilities in drastically reformed rental subsidies, carefully weighted to neighborhood market conditions—a solution that necessarily enlists private profit-makers, but under carefully administered government controls. Such a system would reclaim the dollars previously squandered on excessive overpayments to rent-gouging landlords, and use them to generate new rental aid for tenants previously locked out of financial assistance. Landlords need to make a living, Desmond allows, or they won’t have a motive to provide housing for rent—but unlimited profit-taking off the backs of the poor can no longer endure, any more than we accept, through wage and hour laws, that an employer may pay workers as little as possible for as much work as they can do without collapsing. It is not just government’s role, but also its obligation, to intervene in the workings of the economy to blunt the worst abuses—and this principle should never have excluded housing markets to begin with. Rent regulations like New York City’s were intended to deliver such a result, but they can’t in themselves bridge the gulf between landlords’ costs and poor workers’ meager earnings. At the end of the day, before a low-income tenant can lock the front door and turn out the lights for bed, someone must be at her side to guarantee the rent payment. After block after block and saga after saga of Milwaukee bleakness, over the months of privation that Desmond witnessed, any ray of optimism can feel a bit blinding. One pauses to fantasize about a Congress that could even debate such necessary steps, rather than leaving the nation’s low-income tenants trapped in a cruel parody of past slum reformers’ ambitions—living in conditions that won’t kill them through disease or fire, most likely, but that through their cost and instability generate their own destructive vortex. But the possibility of a breakthrough that makes housing as much of a recognized right as healthcare—and the hard political work needed to render it a reality—is no more audacious than the survival maneuvers that the scrambling tenants of Evicted undertake every day. Remember that the idea of housing vouchers that Desmond embraces was a favorite of President Ronald Reagan’s, as a means to wean the poor off public housing and provide an entree into the private market—and that it was President Obama, in a budget proposal that congressional Republicans refused even to hear, who proposed earlier this year to devote $8.8 billion to such vouchers to end our now-endemic family homelessness. Left and right agree, and so does a powerfully convincing book that examines the poor’s impossible housing situation at point-blank range. So what are we waiting for?